Many child care centers have seen their enrollment of 4-year-olds decline due to New York City's pre-K expansion, which has dramatically grown the number of early education options available to kids this age. In response, some centers have become interested in “aging down” to serve younger children. This would be a tremendous boon in New York City, where quality affordable and subsidized infant and toddler care is in high demand and short supply, despite ample research demonstrating its potential to help families and their children in long-lasting, far-reaching ways. However, it is difficult for child care centers to “age down.” Serving infants and toddlers is more expensive than serving older children and preparing a center to take infants requires a significant investment upfront. In its subsidized child care system, the City directly funds few center-based infant and toddler slots in relation to other age groups. Instead, it prioritizes the less expensive family child care programs for this age group, leaving families with little choice. Private centers that are growing new infant-toddler programs charge parents what it takes to cover the expenses. 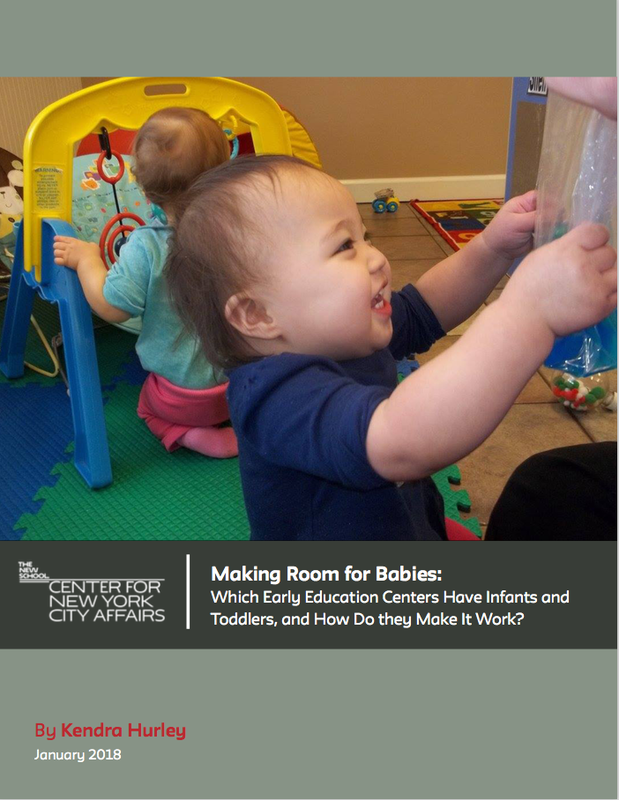 Some centers with longstanding infant programs have special arrangements, like free rent, to help offset the cost of infant care. In the subsidized child care system, being part of a larger, centralized organization that oversees many centers makes infant care more affordable. Today most city-contracted child care centers offering infant care are part of such large organizations. Tapping into different funding streams is also key to making infant and toddler care work in subsidized centers. In gentrifying neighborhoods, a number of these centers have filled slots that the City is not subsidizing with babies and toddlers whose parents pay for care out-of-pocket. When introduced to a center thoughtfully, these “private paying” families have the potential to not only bring in added revenue, but to help create a diverse program, which some researchers say is key to program quality. Early Head Start programs serving very young children come with ample federal funding and are a rare pocket of growth in center-based, subsidized infant and toddler care in the city. They also come with rigorous program guidelines, helping to ensure quality. Some federally-funded partnerships between child care programs and Early Head Start programs are adding resources to help raise the quality of child care. Infant care is very different from preschool. It demands a specific expertise, skill set, and support, yet few infant teachers receive training specific to caring for babies. Place-based models of professional development can be a cost-effective way of delivering individualized instruction. What's Needed for '3-K for All' and Child Care Centers to Work and Play Well Together? The Mayor announced two new plans that could determine the future of the country’s largest child care system for poor and low-income families. Growing interest in early education has led to more infant classrooms in child care centers—but they’re mostly for wealthy families. Milan Gary designed brief, including chart and graph. She is a research assistant for the Center for New York City Affairs working on Graphic Design and website management, and A master's Candidate at Parsons, The New School for Design, majoring in Design and Technology. This brief is made possible thanks to the generous support of the Early Childhood Partners NYC. Many thanks also to the Child Welfare Fund and the Sirus Foundation.